Which of the other settings represented on the Piazza have "Oriental" type regions, official or unofficial? Last edited by Havard on Mon Nov 26, 2018 10:06 am, edited 10 times in total. Greyhawk doesn't really have a canon oriental society as such. Fanonically, there is supposed to be a huge G-China far to the west. Scarlet Brotherhood has some oriental undertones, although it's more like a nation under the thumb of shaolin monks allied with a guild of assassins (subtle nod to the hashishin of the Middle East, perhaps). The civilian population is ethnically Flan with Suloise immigrants, but there's nothing to indicate the underlying culture, once the rulers are removed, is anything other than generic/European/medieval/fantastical. Greyhawk's "Oriental" lands are known as Sufang in the Gord series (Night Arrant) and as Shaofeng in Expedition to the Ruins of Greyhawk. The map in the Dragon Annual #1 refers to the Celestial Imperium. The names are some degree of canon, but we know little else about them, except that there are "lung" dragons found there. Last edited by ripvanwormer on Mon Oct 17, 2011 1:41 pm, edited 1 time in total. ripvanwormer wrote: Greyhawk's "Oriental" lands are known as Sufang in the Gord series (Night Arrant) and as Shaofeng in Expedition to the Ruins of Greyhawk. The map in the Dragon Annual #1 refers to the Celestial Imperium. The names are some degree of canon, but we know little else about them. How does that map mesh with the D&D Chainmail (3e) setting? Havard wrote: How does that map mesh with the D&D Chainmail (3e) setting? 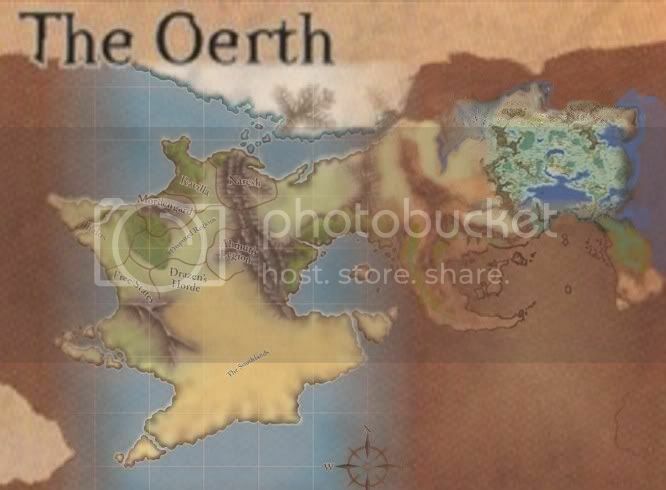 Oerth's "oriental" lands are in between the Chainmail setting and the Flanaess. The Chainmail setting is in the western portion: the nation labeled "Elven lands" in Dragon Annual #1 is Ravilla in Chainmail and the "Kingdoms of the Marches" in Dragon Annual #1 are the "Disputed Regions" in Chainmail. Havard wrote: Which of the other settings represented on the Piazza have "Oriental" type regions, official or unofficial? What Dragonlance products reference to Royodo? Last edited by Angel Tarragon on Mon Oct 17, 2011 2:49 pm, edited 1 time in total. What Dragonlance products reference to Ryodo? Would you also consider Ethengar to fall under this category? If so, then I'd also include Akkila Khan's goblinoid horde. The project has had several names. It started off as ODL (Oriental Dragonlance), was Royodo, was Shattered Lands of Royodo and now seems to be The Shattered Lands. The project has also had a few restarts. It started off as a one-man-band thing, then Nael recruited a few helpers and was following in the footsteps of the Adlatum team, finally they decided to switch from 3e to 4e. The name changes mean that you might have heard of the project under one of its older names, but not the current one. The changes in the structure of the project mean that Nael has taken it back to the drawing board a few times. I think the move to a collaborative process was really great for The Shattered Lands. BTW: Dragonlance Forums have a subforum for The Shattered Lands. Like most parts of Spelljammer, these elements are not fully developed. The Shou Lung is best developed of the three races and is tied into a "core" spaceship (the Dragonship) and the concept of the 5th type of world (the Liveworld). The Shou Lung are known to be in Realmspace, but are also mentioned in SJR7 Krynnspace and a few other products. Some Shou Lung ships have gone rogue (especially if they have found out that the emperor that sent them into wildspace has died and been replaced with a rival). This does not seem quite right to me, as it would appear to be a breach of honour. But the canon mentions them. The Wa ships are only up there to stop the Shou Lung from attacking their territory with ships. They have also fought with the Elven Navy. Apart from that, I can't see them having much of an impact on the Known Spheres. They might not even be known outside Realmspace. The Path and The Way (aka The Path aka The Way) is one of the universal religions of Spelljammer. So that means that the religious part of oriental culture has spread to all parts of the Known Spheres. It is described as coming from "the Oriental groundling nations". I'm still trying to decide if that means that SJ is suggesting that multiple worlds have oriental areas. To be honest, I think that this is a very weak area of the SJ setting. I think it should have been used more in the foreground. There should have been PC options for oriental space PCs. But it is more of a background thing. Even in the Cloakmaster Cycle Novels, the oriental factions were only ever shown as ships in a large battle. I think that SJ's Adventures in Space boxed set or SJR6 Greyspace could have been the perfect opportunity to namecheck Shaofeng/Sufang as one of the places that the explorers of Shou Lung visit, as they travel through Greyspace. Big Mac wrote: The project has had several names. It started off as ODL (Oriental Dragonlance), was Royodo, was Shattered Lands of Royodo and now seems to be The Shattered Lands. Oriental Dragonlance Adventures is a separate project from Shattered Lands. I don't think that Nael used the ODL name, but I could be wrong. The project is, effectively, dead. Pity, I thought he had something good going. Don't forget about Pathfinder's Oriental lands, the Dragon Empires of Tian Xia. This area is featured in the Jade Regent adventure path. Yep. You are wrong. It wasn't Oriental Dragonlance Adventures. It was a standalone website called ODL - Royodo Lands of the Dragon Throne. Nael was doing it all on his own (in 3e rules) and got quite far into it before going back to square one with the Shattered Lands concept, that he worked on with users of the Dragonlance Forums. Later on he modified the name of Shattered Lands, to put Royodo back in there. I got quite frustrated when he decided to switch to 4e, as he and the people working with him went all the way back to square one again*. So he has invented the thing three times (and given himself a lot of work). Although it looks like he has gotten less far than the Adlatum Project team, I think the fact he has done this three times means he may have actually done more work than them. * = Mind you, I was hoping for a 3e netbook, that I could get printed as a hardback (along with Adlatum Campaign Setting) and put alongside my commercial 3e Dragonlance books. Dragonhelm wrote: The project is, effectively, dead. Pity, I thought he had something good going. I thought that the way that Nael put a lot of effort into taking the 3e Oriental Adventures material and giving it a Dragonlance makeover (and the way that he also took Dragonlance material and gave it an Oriental Adventures makeover) was really well done. Even with the process stalled, I would suggest that his work would be something that someone wanting to make oriental lands for other campaign settings should look too. I am hoping that Nael will restart Shattered Lands at some point. Theah is the world of the 7th Sea/Swashbuckling Adventures campaign setting. It isn't connected to the Legend of the Five Rings setting. There is an Asian-style land in Theah, but I can't recall the name of it off the top of my head. Also, you need to add Mahasarpa the campaign setting in the Oriental Adventures Web Enhancement. Havard, can you correct your original post to spell Royodo correctly? There is an o missing. Also, can you update your list please? The first monster manual lists Rakshasa as coming from "India". While this is probably just bad editing, it's interesting to consider whether Greyhawk has some sort of analogue to India on Oerth, which was simply called India in early editions because they hadn't made up a name for it. And of course there are the Domains of the various Asian deities in Planescape. For Mystara, Sind and Shahjapur also apply, as well as several Rakasta cultures of the Bay of Tangor. Cathay. It received a book during the Swashbuckling Adventures era. Birthright doesn't have one, and now that makes me sad because I think the domain play would emulate the courtly intrigues of that genre just as well as the late medieval European genre that was used. Ethengar added to the list under Mystara subsettings. Can't believe I missed that one!